From 2007 to 2012, I photographed the lack of access to electricity in parts of Ghana, Iraq, Ivory Coast, the UK, and the USA. Energy poverty is a critical piece in the mosaic of issues contributing to poverty, and often the one that is least addressed. Abdulai Abubakari holds his infant child, Fakia, in Voggu, Northern Region, Ghana on Feb. 19, 2010. Voggu had power lines for years, but they were never connected to electricity. The material for the lines was eventually stolen, presumably to be sold as scrap metal. Children read the Koran by flashlight at a mosque in Wantugu, Northern Region, Ghana on May 13, 2007. Wantugu had power lines installed in 2000, but government officials failed to connect them to a power source. A surgical team performs a c-section during a power cut in Abobo Sud Hospital in Abidjan, Ivory Coast, April 18, 2011. A week after the end of the military standoff in Abidjan, very few hospitals were open. A lantern is lit on the rooftop of one of the few remaining occupied houses in Binika, Kifree District, Kurdistan, Iraq on July 10, 2010. Binika was once a thriving community with over 150 families, electricity, schools, and a clinic, but it was never completely rebuilt after Saddam Hussein's 1988 genocide against the Kurds. Few people returned to the village, and now, after years of conflict, economic instability, and sanctions on the region, only a handful of families remain. A woman sells food by the roadside in Fulfusu Junction, Northern Region, Ghana, on Feb. 10, 2010. The town is located at a major junction on northern Ghana's main road, between several large cities and the north's major tourist destination. Residents argue that electricity would allow them to capitalize on the tourism and service industries, and cater to passing truck drivers crossing from north to south. A man works on his truck outside of the trailer where he stays in Pajarito Mesa, New Mexico, USA on May 28, 2010. While residents of the Pajarito Mesa legally own their land, a bureaucratic oversight has prevented them from receiving paved roads, running water, and electricity. Isidro Alcudia, Jr. brings donated food into his family's trailer in Pajarito Mesa, New Mexico, USA on Feb. 10, 2011. The majority of the family's food is from food stamps and donations. Ibrahim Haji Mohammed rests in his home in Showara, Kifree District, Kurdistan, Iraq on July 3, 2010. Once a thriving community, the village consists of only a handful of families following the Kurdish genocide in 1988 and years of war and economic sanctions. Power lines were installed in Showara several years ago, but the villagers evacuated during a drought, and they returned to find that the wiring had been stolen. 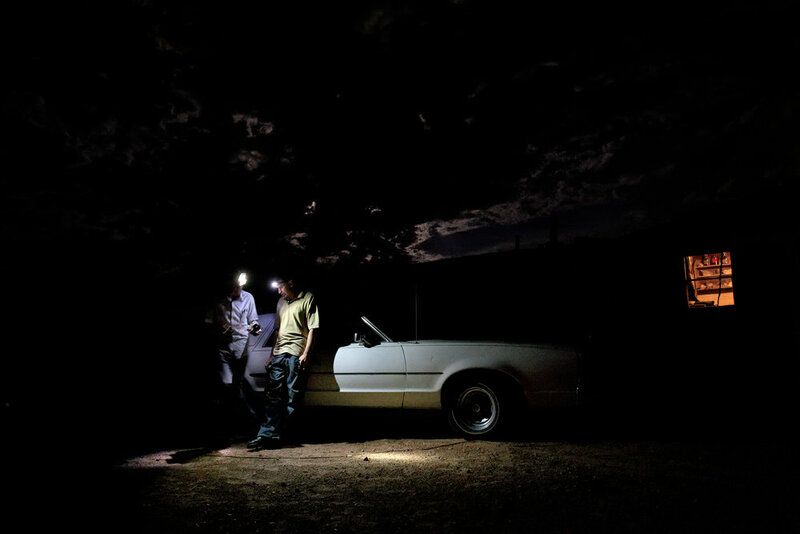 Manuel Soto, center, talks to a friend outside of their trailer in Pajarito Mesa, New Mexico, USA on May 28, 2010. 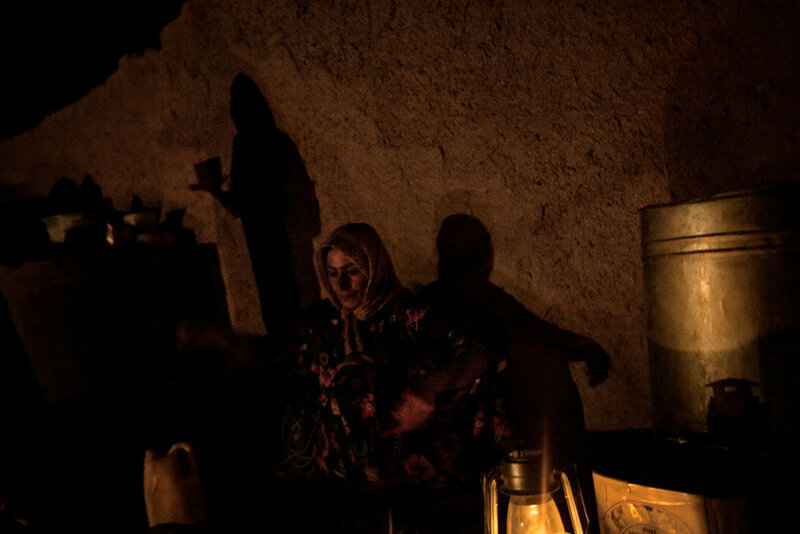 Kharaman Ibrahim Mohammed washes dishes by the light of a lantern in Showara, Kifree District, Kurdistan, Iraq on July 3, 2010. Richard Latham has a late-night drink in his home in Solihull, England, February 19, 2012. When Richard and his wife separated four years ago, he was left with a £400 energy bill that he is unable to pay off. 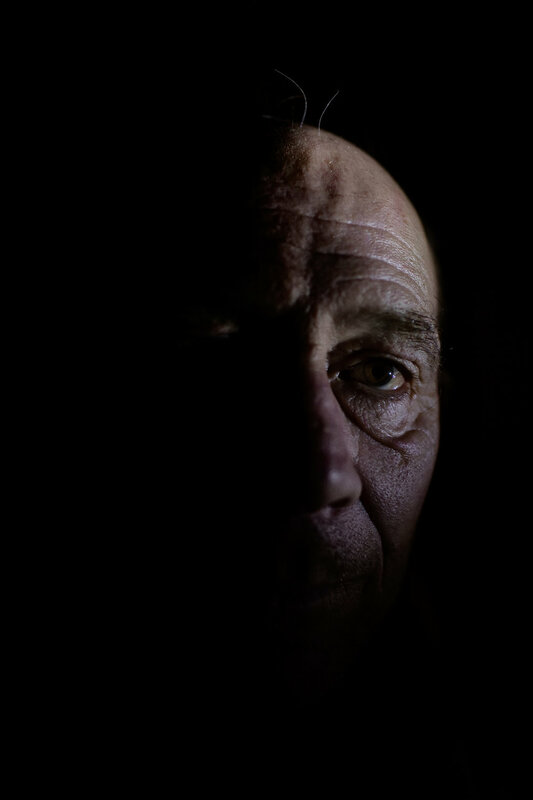 He has not used heat in his home since then, and very rarely turns on light or electrical appliances, for fear of increasing his debt. "I'm a bit paranoid about power," he says. A young girl eats dinner in her home in Voggu, Northern Region, Ghana, on Nov. 17, 2009. Mobile phones charge off of a generator in Voggu, Northern Region, Ghana on Feb. 14, 2010. The people of nearly every household in the village have at least one phone in their possession. The owner of the generator takes a small amount of money for each person to charge his or her phone, while simultaneously using the generator to show a film or power a stereo system. A woman bends over to purchase fruit at the nighttime market in Gbulung, Northern Region, Ghana on Feb. 13, 2010. A man siphons gasoline out of his truck so that he can use it to power a generator for a couple of hours in his trailer in Pajarito Mesa, New Mexico, USA on May 28, 2010. The head teacher of the local Junior Secondary School grades papers outdoors in Voggu, Northern Region, Ghana on Feb. 18, 2010. The school provides accomodations for commuting teachers to stay in overnight, but most of them prefer to return to their homes in the nearby city, where there is electricity. As a result, it is a common problem in northern villages that teachers fail to come to class for more than a day or two each week. 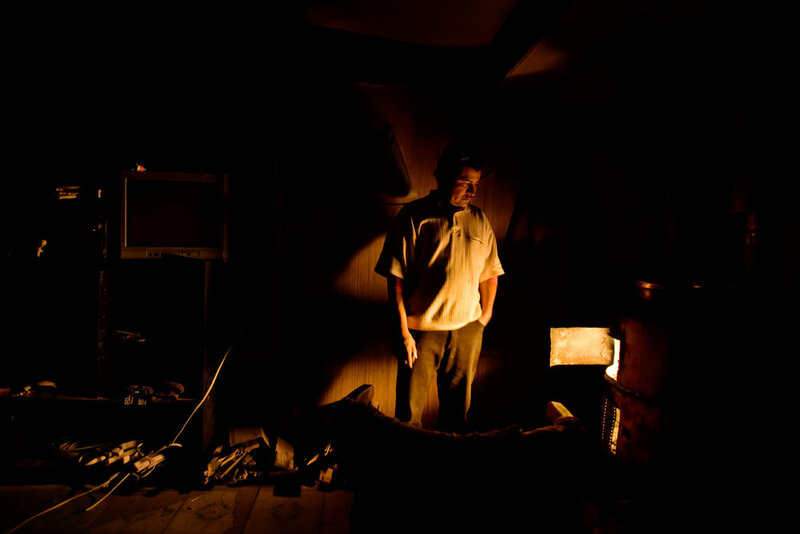 Epifanio Alcudia stands by the heat of a wood stove in his trailer in Pajarito Mesa, New Mexico, USA on Feb. 8, 2011. 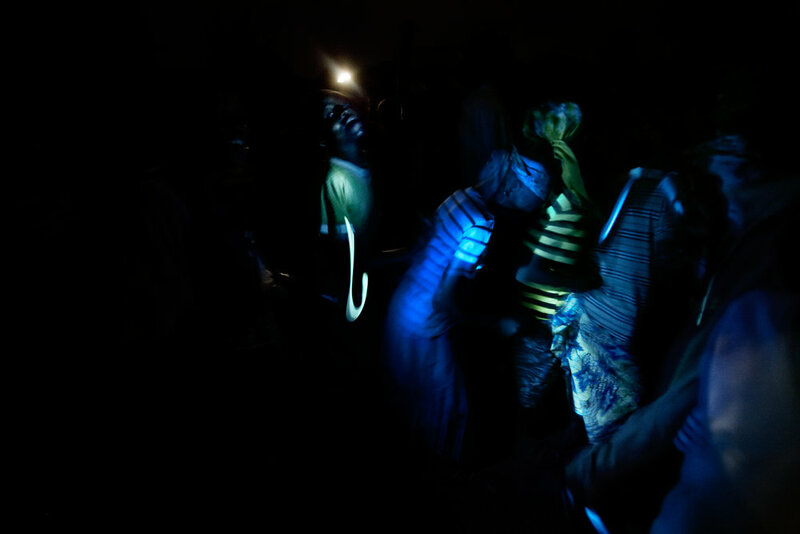 Children dance by flashlight outside of Wantugu, Northern Region, Ghana on June 30, 2007. People board the last car of the night through Wantugu, Northern Region, Ghana on June 27, 2007. The lights of nearby Albuquerque shine in the distance behind a trailer in Pajarito Mesa, New Mexico on May 24, 2010. 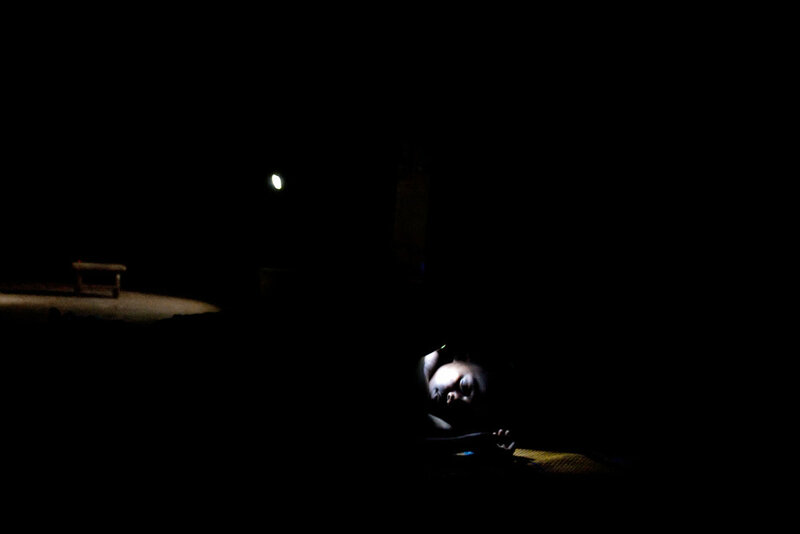 Zenabu Abubakari, a young girl, falls asleep in Voggu, Northern Region, Ghana on Feb. 15, 2010. The women and children of the Abubakari household pose for a portrait lit with flashlights in Voggu, Northern Region, Ghana on Feb. 20, 2010. Women bear the heaviest burden of living without electricity, as they walk for miles to fetch firewood and bring grains to nearby villages to be processed by electronic machinery. Nashmil Aziz Rashid, her brother-in-law, Khalaf Mohammed Qochakh, and the children of their household in Binika, Kurdistan, Iraq. on July 11, 2010. Manuel and Dorris in Pajarito Mesa, New Mexico on May 29, 2010. 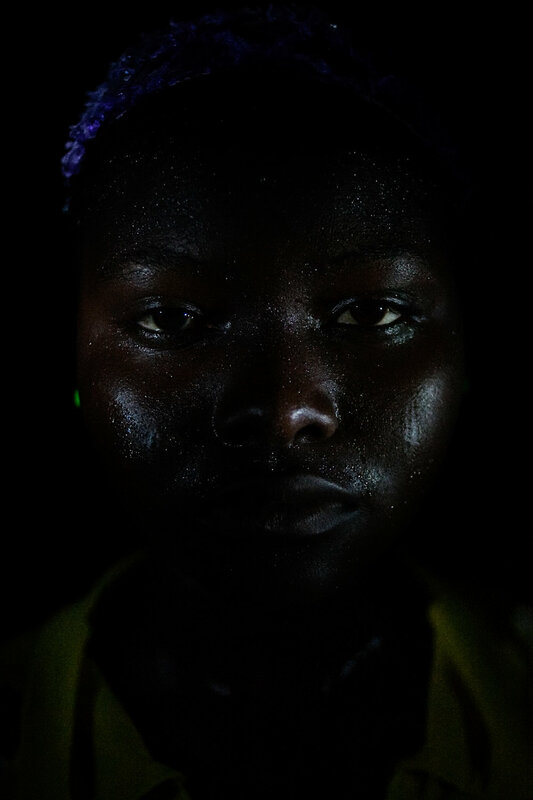 Nasiba Salifu, sweating from dancing, in Voggu, Northern Region, Ghana on Feb. 19, 2010. Richard Latham in his home in Solihull, England, February 19, 2012. Arishe Abukari in Voggu, Northern Region, Ghana on Feb. 19, 2010.